"I will act as correspondent in hell if Mr. Hudson wishes me to do so"
S B Slack, as reported by T M Cash to Frederic Hudson in March 1863. 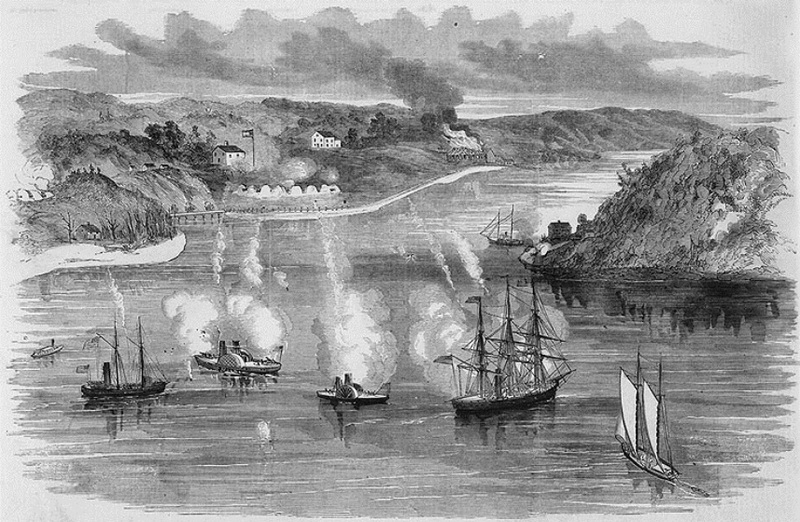 "The Attack on the Secession Batteries at Aquia Creek, Potomac River, by the U.S. Vessels Pawnee, Live Yankee, Freeborn, Anacostia and Lioness, June 1, 1861." Line engraving, based on a sketch by an "Officer of the Expedition" published in "Frank Leslie's Illustrated Newspaper", 1861. Ships depicted are (from left to right-center, in the foreground): U.S. Tug Resolute (called "Lioness" in the original text), USS Anacostia, USS Thomas Freeborn, USS Yankee (called "Live Yankee" in the original text) and USS Pawnee. A two-masted schooner is in the right foreground. 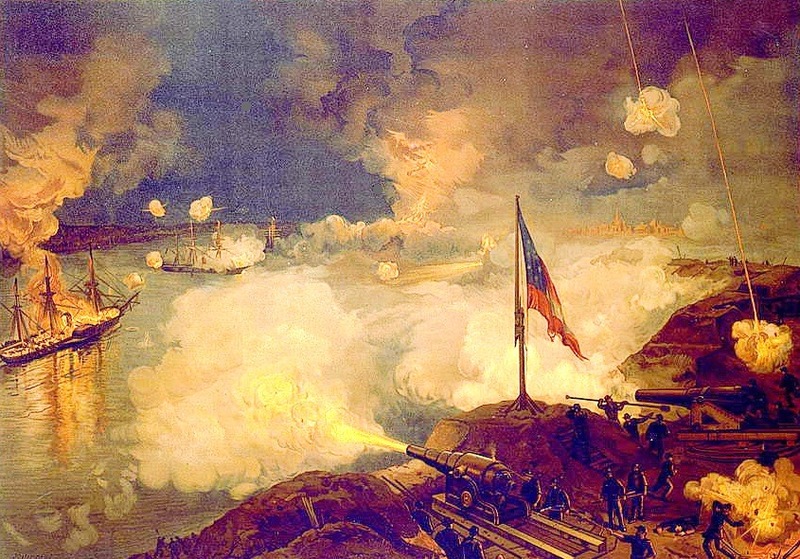 The first Lecture was confined to a description of the battle of Port Hudson, [ ] which, it will be remembered there was a combined attack on the batteriesby the land forces under General Banks, and the Mississippi squadron under the command of Admiral Farragut. Mr. Slack was on board the Richmond, one of the corvettes of the squadron, and his Lecture shows that he made good use of his ears and eyes for he describes everything with a minuteness truly surprising when we consider the danger and excitement of the moments during which his observations were made. The Lecture was instructive and amusing, in some passages rising high above mediocrity, especially the description of the fleet running the gauntlet of the batteries; the scene presented of the flight of shot and shell when the ships opened fire; and the burning of the ill-fated ship "Mississippi". Frederic Hudson, a ground-breaking journalist, was the manager of the New York Herald, for the owner, James Gordon Bennett, from 1840 to 1866. During the Civil War the Herald increased the number of its correspondents, arranging for them to observe the war first-hand, travelling with the Union Army, and sending their reports to New York by telegraph, with the intention of getting the news out as fast as possible. We are on the eve of important movements; Port Hudson is to be attacked in a few days and I am making every arrangement accordingly. Mr Thompson leaves tomorrow to join the army at Baton Rouge and I think that I shall assume the responsibility of sending Mr Slack with the Squadron, as the attack is to be simultaneous by land and water . . . . I yesterday . . . called on Admiral Farragut, and was by him remarkably well received. He has also extended every facility and permits a Herald man to go on board of any ship I may select. PERSONAL - Among the passengers by the United States transport, New Brunswick, announced to sail at 9 o'clock this morning for New York, are Mr. S. B. Slack, correspondent of the New York Herald; . . . . Mr Slack was on board the Richmond, before the batteries at Port Hudson, and also been under fire at Aquia Creek, on the Potomac. Subsequently the Herald published a report of the bitter engagement, which was written by Slack, who was the Herald reporter on the Richmond. The United States steam transport New Brunswick, Captain Winchester, from New Orleans 23rd inst., arrived here [NY] yesterday [Monday, March 30th]. The New York Herald gave an account of its war correspondents in July, 1865. [See that account HERE.] S B Slack is on the list of correspondents.